Legal Terms & Conditions | Éclat Realty Inc.
By accessing and using any of the web sites operated by Éclat Realty , The Canadian Real Estate Association, including mls.ca, you acknowledge and agree to be bound by all of the terms and conditions of such use. In the event you are in disagreement with any of the terms and conditions, DO NOT USE THIS SITE, kindly exit immediately. Trademarks logos, designs, titles, words, slogans or phrases within this web site may be trademarks, service marks or trade names of Éclat Realty Brokerage , all other trademarks service marks and copyrights, logos and the like are the property of their respective owners. The use or misuse of these trademarks or any content on this site is strictly prohibited without the specific written prior permission of owner. All data available on this site are intended for the private, non-commercial use of individuals. Any commercial use of the listings or data in whole or in part, directly or indirectly, is specifically forbidden except with the prior written consent of the owner of the copyright. Users may, subject to these terms and conditions herein, print or otherwise save individual pages for private use. No data including property listings may not be modified or altered in any respect, merged with other data or published in any form, in whole or in part. All information herein are provided upon information and believe and are not guaranteed. Éclat Realty BROKERAGE and its affiliates make no representations about the accuracy, correctness, currentness, usefulness, completeness, accuracy, reliability, or suitability of any data or information whatsoever published on this site. The listings herein are deemed reliable, and not guaranteed. This site is provided without warranty of any kind including all implied warranties and conditions of merchantability, fitness for a particular purpose, title and non-infringement. Neither Éclat Realty BROKERAGE nor any of its suppliers shall be liable for any direct, incidental, consequential, indirect (including loss of profit) or any form of damages which may arise as a result of your use of this site. Any hyperlink to a website owned or operated by parties other than Éclat Realty BROKERAGE that contained herein are provided for convenience only. Such hyperlink (if any) is not an endorsement or approval, nor is it deemed control over such websites. Users are cautioned that any link to such websites is at the sole risk of the linker as Éclat Realty BROKERAGE, is not responsible or liable for any damages in connection with such linking. This website is not secured for communication, any unsecured e-mail communication over the Internet to or from this site is not confidential; it is subject to loss and may be intercepted, read, copied or altered by unauthorized persons. 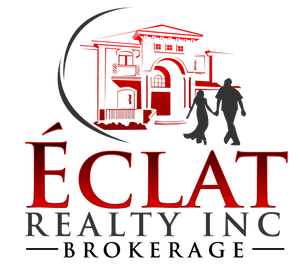 Éclat Realty BROKERAGE is not responsible for and will not be liable to you for any damages in connection with an e-mail sent by you or to you. (i) this office is a member of The Canadian Real Estate Association (CREA) and adheres to and abides by the principles set out in the CREA Privacy Code. All employees and sales representatives associated with this office sign an acknowledgement that they will comply with the requirements of the Code. (ii) We only collect personal information necessary to effectively market and sell the property of sellers, to locate, assess and qualify properties for buyers and to otherwise provide professional and competent real estate services to clients and customers.